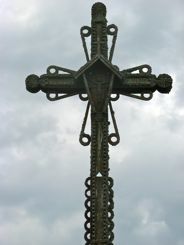 We read about the crosses of Lithuania in the guidebooks before our trip. 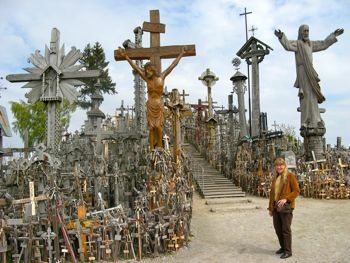 How much of a tourist attraction are crosses? 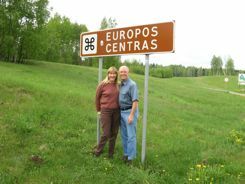 We toured the Baltic countries by car. We started in Riga, Latvia... that is we didn't tour Riga by car... after seeing Riga, we picked up the car there and drove out. Riga's Old Town was a great introduction. We stopped by a castle on the drive to Lithuania, so we were off to a good sightseeing start. Some say the tradition of placing crosses on the hill started in the 13th century in defiance of foreign invaders. Some say the tradition really started after a ruthless suppression of the 1831 uprising against Tsarist Russia. 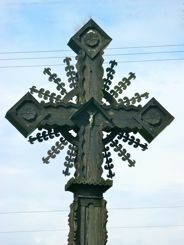 There were hundreds of crosses of Lithuania on the hill by the start of World War II. 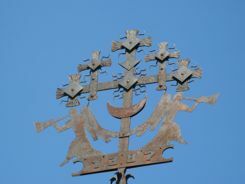 But the crosses reappeared... symbols of resistance to oppression. 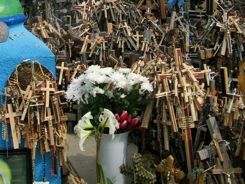 Today the thousands of large and small crosses are left by pilgrims and tourists from all over the world... representing their faith, but also in support of the Lithuania people. As I said, it's not a big sight. If you're not careful you might even miss the road sign at the turnoff. They do have "historical markers"... little brown highway signs, but they are not always also in English.... why should they be? 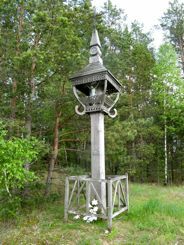 It's about 7.5 miles (12 km) north of the small town of Siauliai. 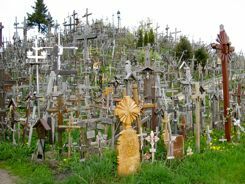 "Do you think that Kryziu Kalnas said Hill of Crosses in Lithuanian?" In Vilnius, we went to the National Museum. 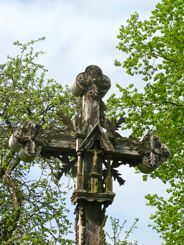 There we viewed a short film on the tradition of Lithuanian crosses... it was then that we started to understand even more their significance. 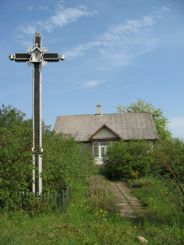 The people of Lithuania have great faith, and they have erected crosses in significant places for centuries. 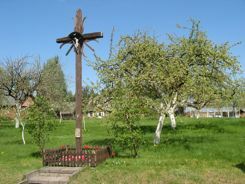 As we drove through the countryside, we noticed more and more of those crosses... some simple, some elaborate... some in town squares, some just in peoples yards. ...and along with the Old Town of Vilnius and the castles and the museums and the trains, those crosses of Lithuania became great memories. Sometimes just a little thing gives your trip a little more color... a little thing like looking for those crosses.